Need to scrap your old cars or vans for cash? Want a reputable Birmingham company to come and take your vehicle away for scrapping? Tyseley vehicle breakers can help. 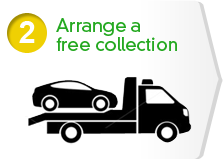 We offer a fast, efficient and – most importantly – free collection service for all makes of cars and vans. Plus, we make sure that you’re issued with a COD (certificate of destruction), you won’t face any penalties from the DVLA, and your car is scrapped legally at a reputable Birmingham scrap yard. As far as UK scrap yards go, we’re proud to say we work hard to be the best Birmingham has to offer. There are many reasons the people of Birmingham choose us as their UK scrap yards of choice. Firstly, it’s down to the fact we offer a free collection service, and will take anything from MOT failures to cars or vans damaged in accidents. Secondly, our customers love the fast, free payment we offer which means there’s cash in your account when you need it most. Lastly, there’s the fact if your car doesn’t need scrapping but you’re after a specific part instead, you can get in touch with our scrap yards and see if we have the item you need in stock – our cash prices are really low. Our scrap yards see a vast number of cars come in for scrapping, so it’s always worth ringing up to check if that specific UK car part is available for collection. 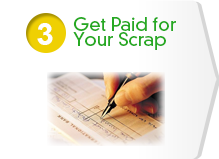 What’s more – our scrap car part prices are competitive so you can save yourself some cash too! 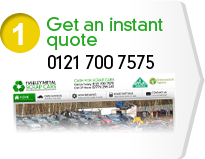 So don’t waste time searching through endless UK scrap yards online – make the wise choice and get in touch with us here at Tyseley vehicle breakers in Birmingham. Our professional scrapping team will arrange your free collection – whether it’s for cars or vans – and deliver your vehicle(s) to our Birmingham scrap yards for scrapping. With our fast, immediate payment service you’ll soon have cash waiting for you in your UK bank account. So stop worrying about what you’re going to do with your old cars or vans, give our friendly UK scrapping team a call on 0121 700 7575, and let us arrange a hassle-free collection to our scrapping yards. We’re confident you’ll love our free collection service, fast cash payment system, and handy location, so get in touch with our UK cars scrapping team today for a free no-obligation quote and to arrange collection. It couldn’t be easier! Your vehicle could be worth a lot more cash than you think! Welcome to Tyseley Vehicle Breakers, a long-established family-run business which is also a DVLA approved facility. To scrap your vehicle legally with confidence in a professional and highly efficient manner. If you like us to arrange a free collection, just fill out the form and we will call you as soon as.